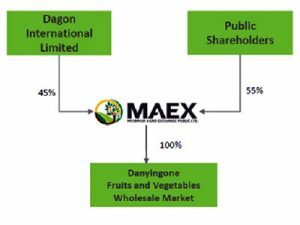 Our Company, MAEX was established after Dagon International Ltd won a tender to developed and manageDanyingone Wholesale Marketas a Public Private Partnership (PPP) model with Yangon City Development Committee (YCDC) by establishing a public company on 14 September 2015. Dagon International Limited made a commitment in the tender to establish a public company to carry out the business by Dagon International Ltd holding 45% of the shares to start with and allow public to hold shares in the newly formed Company. Dagon International Ltd is one of the Dagon Group of Companies member. Dagon Group of Companies is one of the highly regarded and diversified Groups in Myanmar. Dagon Company started its business in 1990 as a trading company, within 25 years it emerges as group of companies in various includes agriculture, property development and construction, hospitality management, retail and distribution, manufacturing, automobile, food, logistics and petroleum. MAEX was incorporation is 1789 of 2015 -2016 YGN. 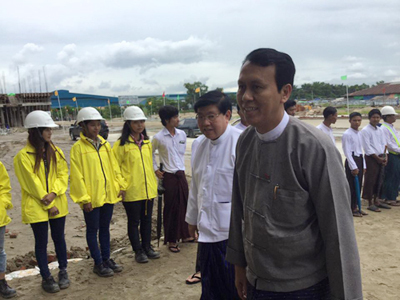 Alongside Dagon International Ltd, other notable promoters of MAEX are Golden Land East Asia Development Ltd. (GLEAD), Willow Investment Co. Ltd and AungNaingThitsar Company Ltd. GLEAD is one of the founding members of Myanmar Thilawa SEZ Holdings Public Ltd to develop Thilawa Special Economic Zone. AungNaingThitsar Company Ltd. is agriculture and logistic businesses. Willow Investment Co Ltd is a company that invests in strategic infrastructure investments. The Authorized Capital of the MAEX Company is Ks 25,000,000,000 divided into 2,500,000 shares of Ks 10,000 each. 21 shareholders invested 15.72 billion kyats before the Prospectus was approved by the SECM (Securities Exchange Commission Myanmar) on 11 January 2017 for the first IPO capital raising.500,000 shares were being put up for subscription with 10,000 kyats per share plus 5% share premium. 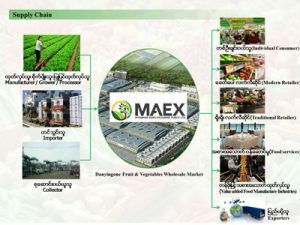 MAEX Company line of business is to invest in integration and strengthening of supply chain in agriculture sector.